The brew day was pretty standard. I mashed in with 4.43 gallons of 162°F water and hit 150.5°F initial mash temp, pretty much right on target. My measured pH was a bit high 5.74 pH, so I added 1.5 mL of lactic acid and brought it down to 5.52 pH. After batch sparging into the kettle I had 7.25 gallons of 1.049 SG wort pre-boil. Following the 60 minute boil I managed to hit the target OG right on at 1.058 OG. I chilled/recirculated the batch down to 170°F using my counterflow chiller then threw in the 0 minute hops and let it whirlpool with the chilling water off for 20 minutes. After the whirlpool I chilled, drained 5.5 gallons into the fermenter, pitched the yeast, then oxygenated. I was left with a beauty trub cone as you can see in the picture below. 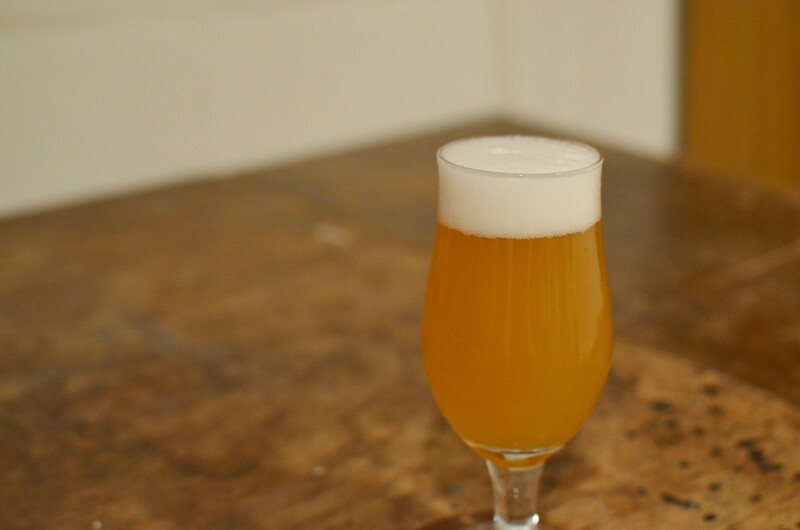 I fermented this beer low (63°F) to keep minimal esters from coming through. Due to the amount of beers that were in the pipeline at the time it took until day 18 before I had time to check gravity and transfer into my dry hopping keg. The final gravity was fairly low at 1.007, thanks to WLP090. I have found that the longer I keep re-pitching the strain the more attenuation I get. The dry hop keg got the 4 oz of hops from the recipe above and sat for 3 days, cold crashed for 1 day, then transferred into a keg for carbonation. The dry hop keg is set up with a stainless strainer on the output to allow me to dry hop free and without any bags. I got the idea from one of my favourite blogs, Bear-Flavoured and his post on his dry hopping method. Unfortunately this keg got killed at the wedding so I wasn’t able to have more than a handful of tastes over the few weeks this beer was in my possession. However, every time I smelled a sample I had to smile since the aroma was the perfect combo of fruity citrus and resiny pine. It definitely hit the mark on what I would consider to be a fantastic example of a west coast IPA. I will be re-brewing a beer similar to this in the next few months since I loved the aromatic qualities that his ratio of hop combos gave the IPA. Thanks for reading! Sorry it took me a month and a half to follow up my last blog post. Hopefully getting married is a good excuse? I have lots of ideas for this blog now that my brewing schedule is freed up. I would like to experiment with new (to me) malts, brew more lagers, and put together some more experimental and instructional posts. I’m also working on putting together a summary post on tips for opening different stitching patterns on grain bags. Cheers! 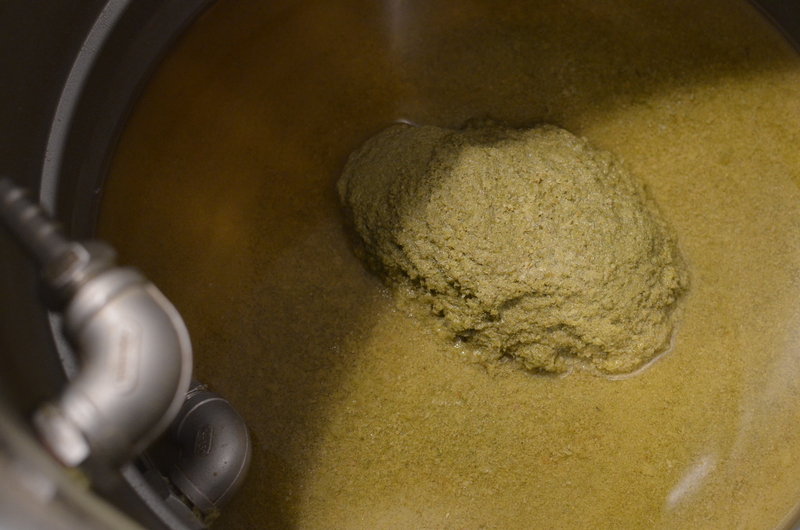 Hmm… the stainless dry hop filter isn’t a bad idea. I do much of my dry hopping in primary now though. This looks great, brewing tomorrow. Cheers, I’ll look into that! Eric, I brewed this verbatim and just tapped it. It’s delicous, but I’m find it has quite a firm bitterness, how did you find the bitterness? I used US-05 instead, and I chillded the wort to 160 before adding the whirlpool hops for 15 min. Hey Chris. That’s strange since I formulated my recipe for 53 IBU specifically because it is on the low end of bitterness for IPAs. Did you use US Magnum for bittering? What were the AA on your stock? I brewed it too, and didn’t find it too bitter at all. Any bitterness finishes really quickly. Everybody who’s tried it finds it very crisp. Solid recipe. Hi Eric , implemented that dedicated dry hop keg . I think it is a great idea. thanks for the blog. I have learned a lot from it. Fantastic name for a wedding IPA. Thanks for the great brew recipe post. Brewing this next weekend. Thanks for the thoroughness and detail, mate. I remember tasting this and think, “holy bloody hell this is fresh”. Good on ya for sharing! Pingback: Introducing: Giggle Splash IPA – The Silly Sir Journey. Thanks for sharing the recipe, I love the balance of pine and citrus. As noted, I’ll have to dry hop a little differently next time, in either a larger bag, or with a strainer over the drip tube. Love that idea in particular. Your definitely had greater aroma. Thanks for Sharing, this article it’s useful to brew wine & beer making in Winnipeg easily.